Guess who has returned to the classroom? I did!!! And I did not go empty-handed!! Under my arm I brought my old friend, Rochambeau! I carried him under my arm into the classroom of a middle school in CT. I revealed him bit by bit over five days to a classroom of hungry students, students eager to learn about the man who helped George Washington win our independence from Britain in 1781. What I carried under my arm was my biography/military history of this hidden hero of America and France. 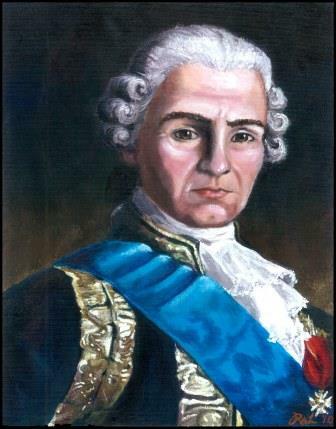 Jean-Baptiste-Donatien de Vimeur de Rochambeau. His story is ever on my mind, ever ready to be proclaimed to eager student of history. My students in this pilot course came through with flying colors! They asked intelligent questions; they learned of the sacrifice made by 18th century women to the war effort in America; they wrote letters back home to France through the eyes and ears of a French soldier who marched across CT with Rochambeau; they wrote editorials to the Hartford Courant of 1781 after witnessing the Battle of Yorktown! I rejoiced! Tagged Battle of Yorktown, George Washington, Jean-Baptiste-Donatien de Vimeur de Rochambeau, Rochambeau's biography and military history, Who was Jean-Baptiste-Donatien de Vimeur de Rochambeau?